Chef Martin Naranjo (Hector Elizondo) has three lovely daughters that he is raising alone. They are all women with very different interests and personalities. He brings the family to the table to share the best Mexican food, freshly prepared, despite his having lost his sense of taste. Carmen Naranjo (Jacqueline Obradors) is a business major whose real love is creating Mexican-fusion cuisine. Leticia Naranjo (Elizabeth Peña) is a teacher in understated clothes with a Jesus fixation. Maribel Naranjo (Tamara Mello) is the baby of the family, works in a record store and wants to be heard. 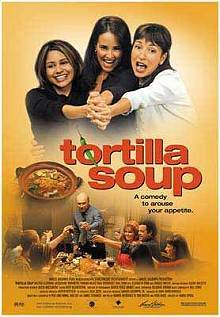 Tortilla Soup takes place in a crucial time in the lives of the family members. Carmen is about to be offered a great job, Leticia is about to meet a great man, and Maribel is about to declare her independence. Meanwhile Martin is about to come to the eye of the mother of a family friend. The mother is played without restrain or self-consciousness by Raquel Welch. The film is warm-hearted, moves at a reasonable speed, has a wonderful soundtrack, and is enjoyable to watch. Martin's resolution was not what I expected, maybe that comes from there being two versions of the screenplay; but the family ends up at the table to happy music. What more could you want?